It has been a pretty looong time since I talked about anything but home decor, but man clean beauty products are worth to switch up. There are SO many amazing clean products out there, beware. Once you start you seriously want to dump your whole makeup bag. I decided to try clean beauty products after a friend introduced my to ‘Think Dirty’ - an app that let’s you scan your beauty products and assigns a dirty score from 1 to 10. I’m sure you’ve heard the astounding stat that the personal care industry is highly unregulated. With the last regulation happening in 1938, companies have pretty much free reign to use ingredients that are known carcinogens and endocrine disruptors. While that got my attention, my switch was really driven by my dry skin and a desperate attempt to find something to fix it. What I love about clean beauty is that everything in it actively works for your skin where other products have fillers, synthetics and fragrances (fragrances are some of the worst offenders). Here are the seven, clean beauty products that have changed my beauty routine. Applied to a dry face, oil cleansers bond to the oil on your face. It smells amazing like you’re on a tropical vacation while removing my eye makeup without any harsh smelling chemicals or any need for tugging under my eyes. A local company, One Love products are made in Georgia. This serum is a godsend for my skin. It’s the one product I can’t live without. I get occasional breakout around my chin and this serum has drastically reduced them. Marie Veronique has been my favorite brand I’ve found to date for adult acne. 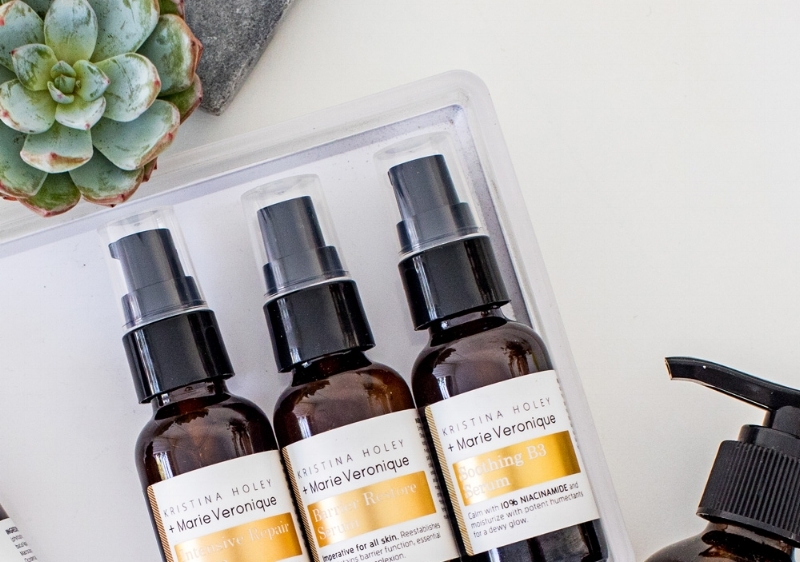 The brand uses non-toxic ingredients and the founder is a chemist. The brand has a whole routine of products to use for different conditions from acne to rosacea to aging. This serum feels so hydrating for my dry skin. I use this serum to protect my skin from the pollutants I’m around in my day by living in the city. Why I Love It: One of the tricks for dry skin is to make sure you’re exfoliating both manually and chemically. This mask has been my favorite chemical exfoliator. It’s a jelly like consistency you put on your face for up to 20 minutes giving a spa-like feel. This is a splurge item. Try a sample first to see if it works for you. I love to use this mask after the refining mask above. It’s an amazing hydrator and makes it feel like I’ve just gotten a facial. Perfect for after a day in the sun or a plane flight. Why I Love It: I’ve used foundation from Laura Mercier, Bobby Brown, Trish McEvoy, Kjaer Weiss…you name it. This is my current favorite. It’s moderate coverage that’s infused with serums. It comes with a pump applicator and one pump is more than enough to cover the whole face. Why I Love It: My go-to shampoos from Aveda and Bumble & Bumble started to cause breakouts and congestion in my skin. I switched to this natural brand that’s color safe and smells amazing. Have you made the switch? Any of these products make your list too?